A week to go – let’s make some noise! We’ve set the date, we’ve laid our plans, we’ve spread the word – and now it’s over to you. A week from now, we’ll be gathering in Edinburgh, in Inverness and in Aberdeen to let people know that we expect change. POP is about the people: the ones who already cycle, and who daily fear that the next close pass will be their last. It’s about the families who have to take huge detours and muddy paths just because they’ve got this mad idea that cycling to school would be good for them and good for the environment. It’s about the kids strapped into a car that’s stuck in traffic because it’s too difficult to walk or cycle instead. It’s about people choking on traffic fumes, and caught in congestion, and afraid to cross the road because that road was designed for the movement of cars, not the life on the street. It’s about the spouses and parents and children who can never quite shake off the fear that their loved one won’t come back when they set off on their bike. We may lose sight of it occasionally but PoP is, above all, a protest. It’s about saying we’ve had enough of being frightened. We’ve had enough of being squeezed on the roads and dumped onto pavements. We’ve had enough of “cyclists dismount” signs. We’ve had enough of keeping every sense alive, because we don’t know whether or not the next driver we meet will see us in time, however bright and visible we may be. Things are changing – and they’re changing largely because of PoP – but they’re not changing fast enough. Over 2000 people a year in Scotland are dying from pollution alone. We can’t wait, hoping that things will get incrementally better here and there. It’s not okay that we’ve let our towns and cities be dominated by cars. It’s not okay that it’s not even safe for a mum to take her infant on a bike. 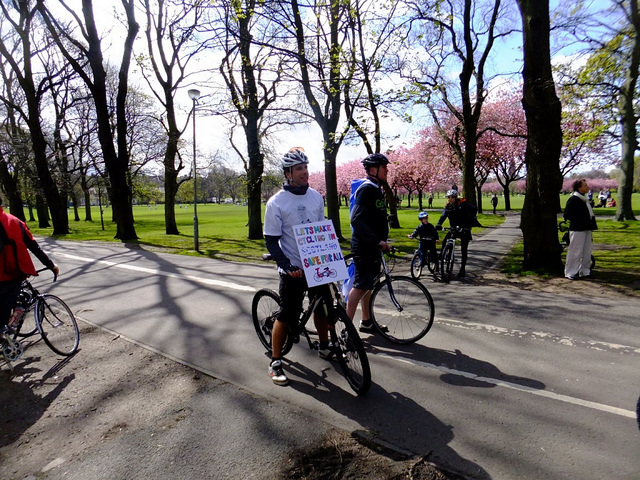 It’s not okay that we’re choking on our own fumes because we haven’t made it possible for everyone – young or old, fit or not – to take to the streets on the most efficient, least polluting means of transport ever invented (and invented in Scotland no less). So, this year, let’s make some noise. Let’s get out there with our signs and banners and flags and costumes and whatever it takes to get the message across. We’ve done what we can – now it’s over to you. Wherever you are in Scotland, we need you at PoP. On foot or on a bike, it doesn’t matter. 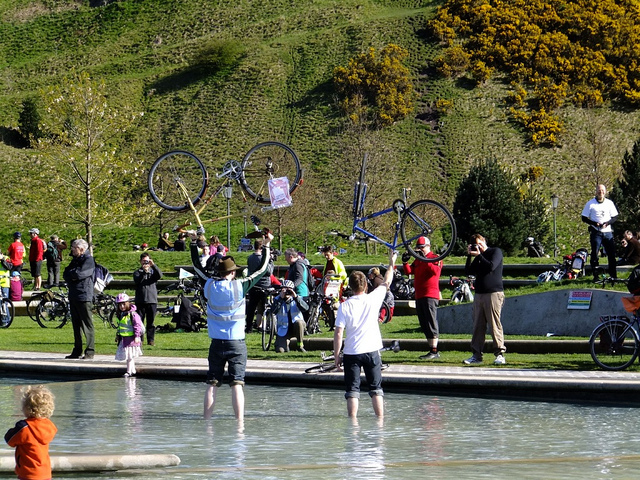 Just get out and join us – and help us make Scotland a cycle-friendly country. Because everyone will benefit – not just those of us on bikes.